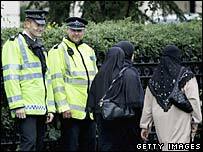 A few days ago, I had a post about UK police increasing their presence in Muslim areas, to deter attacks against Muslims after the latest terror arrests. I pointed out that there’s no need, since the more that Muslims kill or plot to kill, the more hate crimes there are against Jews. That’s why in Norway last month Jews were advised against speaking Hebrew loudly on Oslo streets or wearing Jewish emblems after a Jewish man wearing a yarmulke was assaulted. But notice that Muslims are never told, for their protection, to not wear those nightgowns or those shmatas on their heads. Again, proof of my thesis that the more havoc Muslims wreak, the less popular Jews become.